If you’re living in constant back pain, you NEED to discover what’s causing it. Because back pain is demoralizing. Simple things like sitting, walking stairs, bending down, or even just getting out of bed might be excruciatingly painful. But, these are not the only alternatives. Today, we’re going to look at some of the most commonly misdiagnosed causes for back pain, along with non-surgical (and non-drug) treatment options that work. The spine is an amazingly engineered structure of interconnecting bones, ligaments, discs, muscles, and nerves – all working together to provide strength, support, and flexibility. …So your back can serve its its dozens of functions for daily living. Because of its abundance of moving parts, the spine is susceptible to back pain from one or any number of compound issues that may affect one another. On occasion the jelly-like center of a disc can break through the tough “outer wall” of the disc, leading to inflammation, pinched nerves, or pain from the tear itself. A bulging disc occurs when the disc swells or becomes weakened in a certain spot, allowing the inner contents of the disc to push outward toward the outer disc wall without bursting through. These can cause inflammation and nerve pressure. When we are young, our back discs are soft, pliable, and well hydrated. As we age, our discs lose hydration and wear down. Over time, disc walls may weaken and tear, leading to pain, instability, and other symptoms. Strains can occur when you injure the ligaments, tendons or muscles supporting your spine. Some of these strains cause painful muscle spasms or swelling. A pinched nerve occurs wherever there is pressure on a nerve. Also known as cervical radiculopathy, a pinched nerve can be caused by pressure from bone spurs, ligament, or a herniated disc. And pain may radiate into the hip, leg, or foot. Spinal stenosis is caused from a narrowing of the areas of the spinal column through which nerves pass. This is commonly caused by aging, and can put pressure on nerves. This is caused when one vertebrae slips forward and out of place, typically in the lower back. It can cause painful disc and nerve problems. Scoliosis is a condition that results in curvature of the spine. It generally develops from birth and may worsen as a person gets older, leading to nerve pressure and other conditions. A broken back may be brought on by sudden trauma, an accident, or fall when you fracture a vertebrae in your spine. 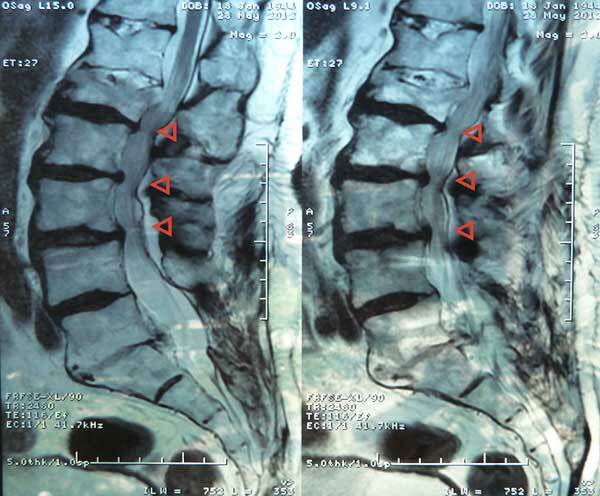 Left untreated, spinal fractures can cause chronic back pain. 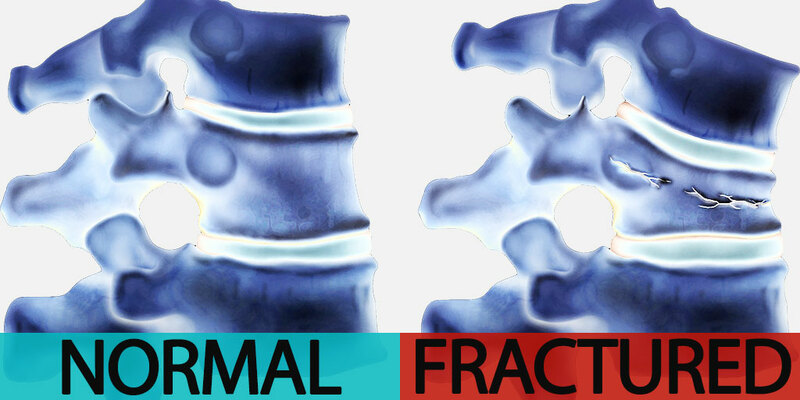 VCF fractures are caused by weakening of your vertebrae, usually caused by osteoporosis. The vertebrae compresses from loss of bone density. One VCF often leads to multiple VCFs, causing a hump or hunch back and is very painful. Chronic systemic inflammation may be caused by habitual or environmental factors – such as diet, exercise, stress, smoking, alcohol – and may lead to excess inflammation of spinal tissues. Osteoporosis is a condition caused by weakening of the bones and loss of bone density. Osteoporosis leads to compression fractures, a curvature of the spine, and knife-like pain in your back. This occurs as a result of wear and tear of discs and facet joints. It’s sometimes called spondylosis or degenerative joint disease. Arthritis spondylitis occurs in the joints and ligaments along the spine. It’s a form of arthritis that causes inflammation of the spinal joints and can lead to sever, chronic pain. Kyphosis refers to excess curvature of the spine, usually in the upper back. Multiple vertebral fractures cause this condition and results in a hunchback or dowager’s hump. If you’re like a lot of people suffering from chronic back pain, you are on a mission. You are looking for someone that can help you, someone that can fix the problem. And live pain-free… or at least live with a lot less pain. The problem is that some back pain issues are difficult to diagnose, due to the complexity of the musculoskelatal structure of the spine. Many doctors, even spine specialists, have a difficult time pin-pointing the exact cause of pain. They mistakenly attribute the pain to an incorrect cause, or they don’t take the time to correctly determine the source of pain. Or maybe there’s a disconnect between the radiologist (reading your MRI) and the doctor. …the radiologist may be guessing at what’s causing your pain. So while you may be diagnosed and treated for a herniated disk, the actual pain-causing problem could be a spinal fracture (or some other underlying condition). An experienced and caring spine specialist will take the time to properly diagnose your condition and present a treatment plan to address the root cause of your back pain. Physicians have spent the last couple of decades caught between the war on drugs and the war on pain. Pain is absolutely undertreated (or mistreated) for a number of reasons. That many doctors erroneously think pain should be treated with pain medications. While narcotic pain medications (opioids) may temporarily give back pain relief, these medications do not address the actual cause of back pain. Rather they only treat the symptom of pain without addressing the underlying cause of the pain. A basic tenet of medicine is that we should never treat the symptom when we can treat the underlying cause. Narcotic pain medications are designed to produce short-term, temporary pain relief for intense or acute pain. Opioid drugs work by weakening pain signals sent to the brain, but they do not treat the underlying conditions causing back pain. Due to their side effects, the body’s tolerance build-up over time, and the risk of addiction – prescription painkillers are clearly not meant for long-term pain relief. 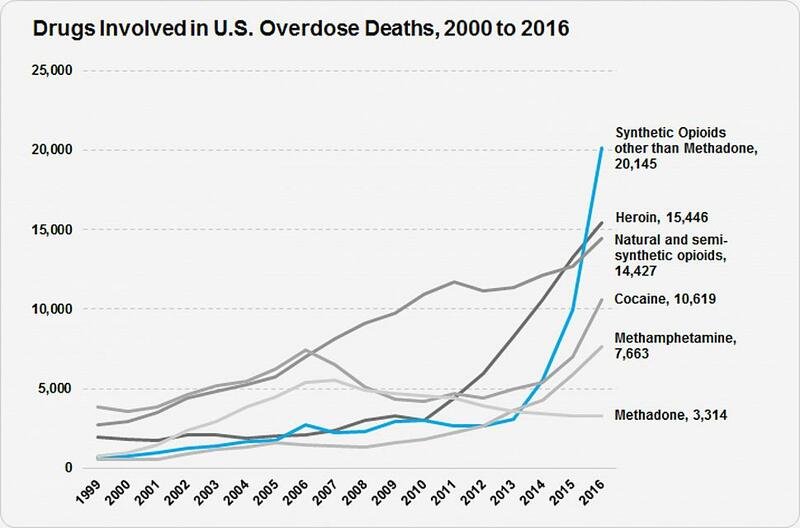 However, over-prescribed narcotic medications have skyrocketed in the last two decades. Calling the situation an epidemic, the National Institutes of Health is pouring a tremendous amount of resources into research and funding for better methods of pain management for chronic pain sufferers. In a large majority of cases – even for patients with severe, chronic back pain – minimally invasive therapies provide a better alternative treatment option for back pain than either drugs or surgery. And many of these pain treatment options provide long-lasting back pain relief while fixing the problem at its source. If you can avoid invasive back surgery that takes months for healing and recovery, it’s worth exploring your options. Here are a few treatment options used in place of surgery or narcotics. Radiofrequency ablation (also known as radiofrequency neurotomy) is a minimally invasive procedure through which a heat lesion is created on a nerve to interrupt pain signals sent to the brain. Radiofrequency waves are used to heat the end of the instrument used during the procedure. Targeted nerves are not involved in muscle control or feeling sensation, so the heat lesion poses little risk of affecting those areas. Kyphoplasty is a minimally invasive medical procedure that can repair spinal fractures (vertebral compression fractures) and restore structural integrity to spinal vertebrae. Kyphoplasty is an outpatient procedure that fills collapsed vertebrae with a special bone cement to restore the shape and strength of collapsed vertebrae. Studies show a 72% reduction in back pain with this procedure, with an astounding 94% success rate. Osteoporosis management includes treatment of the entire disease – repair of damaged bones, prevention of additional fractures and active guidance for promoting future bone health. This may include consultation about lifestyle changes, medication changes, and balancing hormones to build stronger, healthier vertebrae to support your back. With all of the risk factors for bad bone health – including medications like steroids, acid blockers, anti-depressants and anti-anxiety medications – it’s never too early to consider the possible effects of osteoporosis on your life and to consider steps you can take to prevent it. An epidural steroid injection may be used to reduce inflammation around spinal nerves, thereby reducing pain associated with pinched nerves and reducing pain commonly associated with conditions such as sciatica. During the procedure a steroid (cortisone) is injected directly into the epidural area of the spine. A medial branch block is an injection of a strong local anesthetic on the medial branch nerves that supply the facet joints and the disks. A relevantly recent discovery is that these nerves actually carry pain sensations from the disks themselves. As a result, blocking these nerves can stop a lot of pain from disk pathology such as bulging disks and herniated disks. The facet joints, also called zygapophysial joints, are part of the stability framework of the spine consisting of pairs of small joints between the vertebrae and the back of the spine. Each facet joint contains medial branch nerves that can become inflamed for a variety of reasons – osteoarthritis, spinal stenosis, trauma from a car accident or fall – and cause pain. Platelet-rich plasma therapy is used primarily in the treatment of sports-related injuries affecting soft tissues. Platelets in our blood contain hundreds of growth factor proteins that promote healing. Platelet-rich plasma is plasma that includes a concentration of growth factors 5 to 10 times greater than normal and has been used to accelerate healing from injuries. If you or a loved one is suffering from back pain, our office will provide a proper diagnosis and present a treatment plan that aims at providing lasting back pain relief. Our office can help. 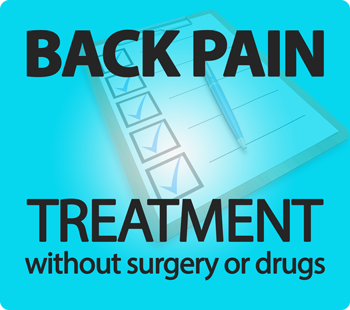 If you’ve had back surgery or feel like you’ve tried everything to get back pain relief, contact our office. 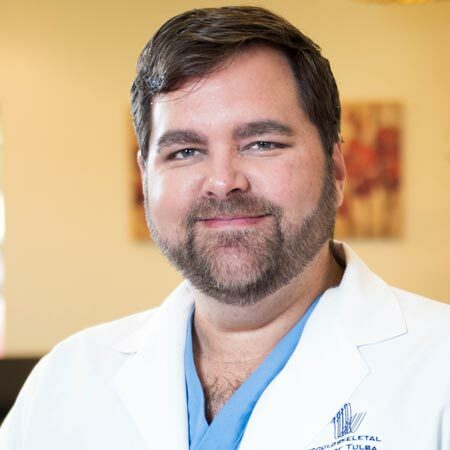 Dr. James Webb, M.D. is a Board Certified musculoskeletal radiologist who specializes in bone health and interventional pain management in Tulsa, Oklahoma. As an experienced spine specialist, he helps patients with minimally-invasive procedures to fix back pain without surgery or pain medications.